That big, unspeakable thing that if not fastidiously ignored might just blow every complicated, nuanced familial tie up in smoke. 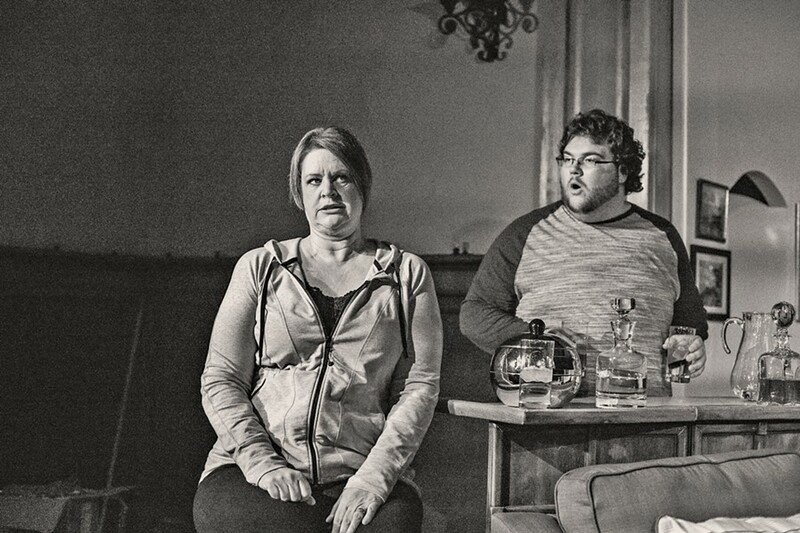 It's uncomfortable, but oh so real, and Wine Country Theatre in Paso Robles manages to bring all of those sensibilities to its current production of the contemporary drama Other Desert Cities. PUTTING IT OUT THERE Polly (Mary-Ann Maloof, foreground) reads her daughter's soon to be published book that explores a family tragedy while her sister Silda (Cynthia Anthony) and husband Lyman (John Laird) look on. Written by playwright/screenwriter Jon Robin Baitz (Stonewall), this Broadway play debuted in 2011 and digs deep into a Hollywood family's dark past a few years after the 9/11 terrorist attacks on the Twin Towers in New York. It's Christmas Eve 2004 in Palm Springs. Writer Brooke (Christine Miller, recently seen at Cherent Ranch Theatre in Dead Man's Cell Phone) and her brother/reality TV producer Trip (Garrett Larsen, a veteran with the likes of the Cambria Center for the Arts and SLO Repertory Theatre) are home to spend the holidays with their super Republican parents—Lyman (Grammy Award winning vocalist John Laird) and Polly (Mary-Ann Maloof, seen on stage at the Cambria Center for the Arts and SLO Repertory Theatre), who used to be part of the golden days of Hollywood as an actor and screenwriter, respectively—along with their alcoholic aunt Silda (Cynthia Anthony, founder of Wine Country Theatre). The whole thing takes place in the Wyeth family room and essentially boils down to five people talking (and sometimes avoiding talking) to each other. 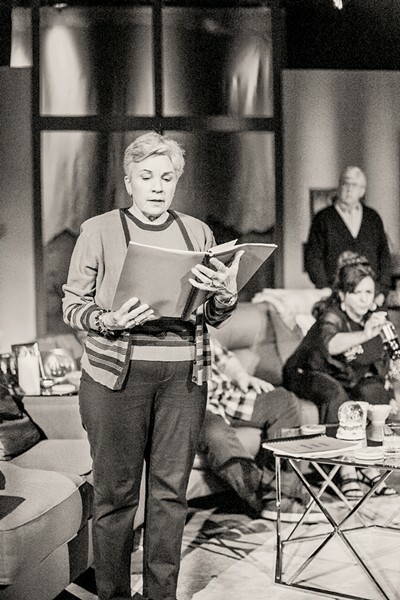 But it is a masterful work of love, secrecy, tension, and the trauma of one family that director Elaine Fournier (acting and directing credits include The Great American Melodrama, Cuesta College Theatre, and the Pioneer Players) has woven together. Boiling underneath the surface of chitchat about where to eat dinner is a barely scabbed over wound. Years ago, the family's oldest son, Henry, got involved with a radicalized group. He may or may not have been involved with planting a bomb that led to the death of an innocent man. Henry's body was never found, though he is assumed to be dead. Brooke, who moved all the way to the East Coast to get away from everything, has struggled with depression since the death of her older brother. In an attempt to grapple with that, she's written a memoir about her Hollywood family and what led to Henry going astray. This revelation leads to some truths about love, blame, and perception and ultimately unburies yet another family secret. THINGS UNSPOKEN Siblings Brooke (Christine Miller) and Trip (Garrett Larsen) navigate tense family dynamics amid a new development in Other Desert Cities. At the heart of the story are many universal questions, one of which Trip brings up when his sister refuses to see the family's issues with her memoir. "What do you want?" Trip asks Brooke. "For me to say 'Oh boy sis—sure—art comes before life?'" Arts Editor Ryah Cooley is staying out of the family drama at rcooley@newtimesslo.com.